The cool-buffing, swirl-busting, 100% wool pads from Optimum! Optimum 100% Twisted Wool 8 Inch Pads are built for speedy swirl and scratch removal with Optimum Hyper Compound Spray. This winning combination will remove 1500-2000 grit sanding marks and leave a near-perfect finish. Use Optimum 100% Twisted Wool 8 Inch Pads with your high speed rotary polisher to create paint perfection. The Optimum 100% Twisted Wool 8 Inch Pads are part of a complete polish system including Optimum Hyper Compound, applied with a 100% Twisted Wool 8 Inch Pad, followed by Optimum Hyper Polish, applied with a Optimum Foam Finishing 8 Inch Pad. 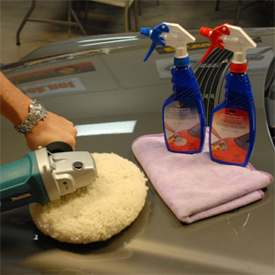 This two step system consists of the only commercially produced SPRAY car polishes. Optimum 100% Twisted Wool Pads are part of Optimum's complete polishing system. Optimum Hyper Compound Spray and Optimum Hyper Polish Spray were both developed to streamline the process of buffing out new vehicles at a major auto plant. 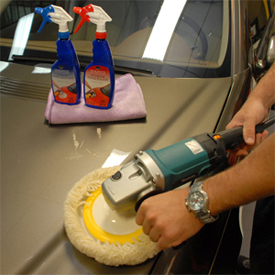 The spray application of each polish enables it to disperse evenly over the pad to prevent dry buffing and to promote uniform polishing. 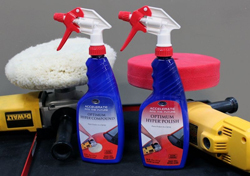 These revolutionary polishes produce no dust, do not sling, and are simple to clean-up - what more could a detailer ask for? How about the right pads to make the process even easier. Optimum 100% Twisted Wool 8 Inch Pads are made of a long-lasting, non-linting twisted wool. The twisted wool fibers cut better than fluffy wool pads, meaning these pads can level deep scratches and sanding marks in seconds. Optimum 100% Twisted Wool 8 Inch Pads run cooler than most wool pads in order to prevent damage to clear coat finishes. The well-made twisted wool produces no lint to get in the way of your flawless finish. Optimum 100% Twisted Wool 8 Inch Pads leave far fewer compounding swirls than traditional wool pads, especially when used with Optimum Hyper Compound. This combination will create a deep shine that's almost ready for the showroom. Just a quick pass with Optimum Hyper Polish Spray and an Optimum Foam Finishing 8 Inch Pad will bring out the paint's full potential. Single-sided Pad - The single sided 8 inch pad has secure hook and loop fasteners. Use it with a 7 inch flexible backing plate on your high speed rotary polisher. A centering hole enables you to center the pad on the backing plate to prevent wobbling and ensure an even finish. Double-sided Foam Pad - The double sided 8 inch pad attaches to your rotary polisher using Optimum's Double Sided Pad Adapter. The adapter sits in the center of the pad, ensuring that the pad stays perfectly balanced. The double-sided pad gives you twice the usable surface in a single pad. Optimum 100% Twisted Wool 8 Inch Pads are your key to success when it comes to fast, flawless swirl removal with Optimum Hyper Compound Spray. The quality twisted wool runs cooler and cuts faster to restore your vehicle's shine in less time.